Garlic is a lovely ingredient to add to an oven-baked dish, but many people find it hard work to peel garlic cloves. 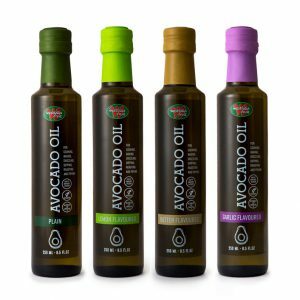 The Westfalia garlic-flavoured avocado oil has a delicious flavour that you can add without any hassle. 1. Preheat oven to 180 °C. 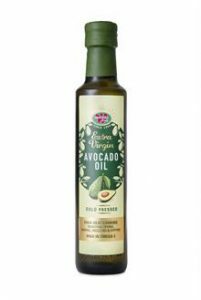 Mix avocado oil, white wine and origanum in a large mixing bowl. Season well with salt and pepper. 2. Toss chicken, onions, mushrooms and baby marrows into the avocado oil mixture and coat well. 3. Place in a large oven dish and cover with foil. Roast for 30 minutes and remove the foil. Add the tomatoes. 4. Mix through once or twice so that the chicken and veggies are well coated with the pan juices. 5. Roast without the foil, for another 20-30 minutes or until the chicken is golden brown and cooked, but not dry. 6. 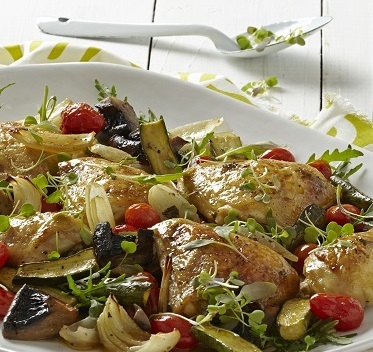 Place chicken, veggies and pan juices in a serving dish and toss with the fresh rocket and herbs. 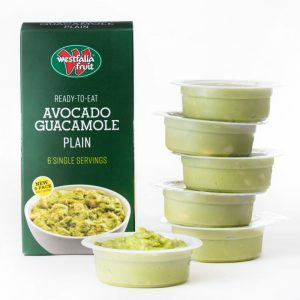 Serve hot or at room temperature as a delicious summer meal. 1. Substitute chicken pieces for pork sausages, if preferred. 2. Serve the dish with couscous to soak up all the pan juices. Polenta or crusty bread also works well. 3. Substitute the garlic-flavoured avocado oil for the lemon-flavoured oil for a zesty difference.